How do I delete tags from my Tumblr blog's search bar? I'm not talking about the main search bar. I'm talking about the little side one that most blogs have. 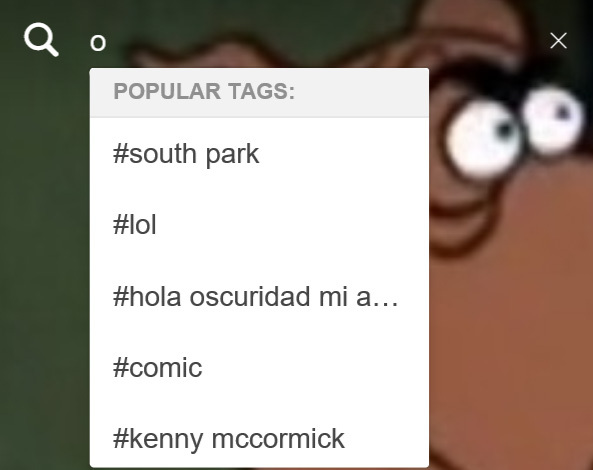 Whenever I, or another user, clicks on said search bar, a little drop box labeled "Popular tags" appears, and shows the tags that I most frequently use. I would like to delete some of these tags, so nobody can see them. Everyone keeps saying that pressing the little "x" next to the search should delete it, but it's not working. I even deleted all of my posts that contain the unwanted tags, but they are still suggested and show up when I click on the search bar. Am I doing something wrong, and/or is there a way to delete certain tags? Browse other questions tagged tumblr tumblr-tags or ask your own question. Ping.fm tagging on Tumblr/ add tags to each post? Old tags on my Tumblr have stopped working. Can I fix them? How can I delete saved tags in Tumblr? Made Tumblr tags visible, how to style them properly? How do I delete tags from my Tumblr blog's searchbar? How can I make my Tumblr tags italicised?